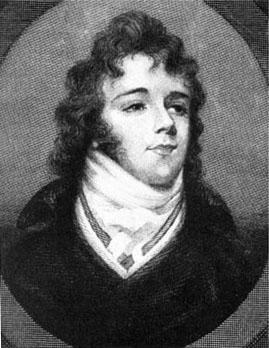 George Bryan Brummell (or Brummel), most famously known as "Beau" Brummell, was born in Britain in 1778 and died in 1840 in France. His dress and demeanor established many of the canons of dandyism. Although he was not an aristocrat by birth, he rose in the ranks of Regency society (1795-1820) and belonged to the circle of the Prince of Wales, known as the Prince Regent, who became King George IV. His father was a civil servant and secretary to Lord North, though his grandfather was probably a valet. 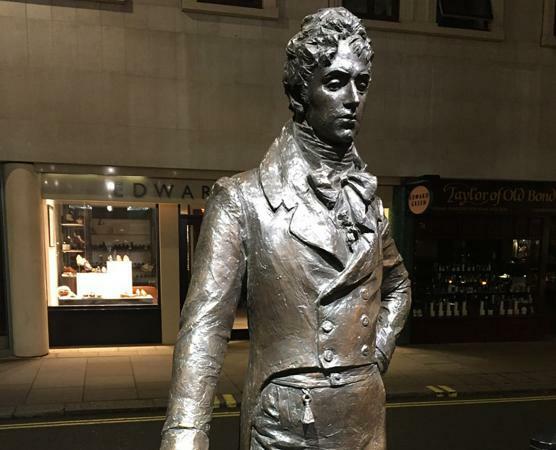 Brummell was educated at Eton and left Oxford at the age of sixteen when he inherited a sum from his father estimated to have been 15,000 to 65,000 pounds. He became a cornet in the Tenth Hussars, the Prince's regiment, known as "the Elegant Extracts," and was a captain by the time of his retirement from the military in 1798. He then began his life as a stylish gentleman in his houses in Chesterfield and Chapel Streets in London and was a member of Brooks's and White's on St. James's Street, the most exclusive gentlemen's clubs of his day in an elite founded on the principle of exclusivity. Brummell lived above his means, but his association with the Prince of Wales and his personal sense of style and cutting wit assured him a privileged place among the fashionable set. Many anecdotes mythologize his life, and though there is speculation as to his possible homosexuality, he was never linked specifically with a man or a woman, which the writer Jules Barbey d'Aurevilly took as a sign of his narcissism. In the second decade of the nineteenth century he fell out with the Prince Regent, and his creditors became more insistent. On 16 May 1816 he left Britain for Calais, France, because of his mounting debts and spent his last twenty-four years as an impoverished exile in Calais and then in Caen, Normandy, where he finished his life in a sanatorium. Brummell's dress was austere and elegant. It was not flamboyant or extravagant but consisted of impeccably clean linen and finely tailored clothes. As Captain William Jesse (who published his biography in 1886) noted and Robert Dighton's portrait of 1805 illustrates, "His morning dress was similar to that of every other gentleman-top boots and buckskins, with a blue coat and a light or buff coloured waistcoat…. His dress of an evening was a blue coat and white waistcoat, black pantaloons which buttoned tight to the ankle, striped silk stockings and opera hat." Although this description suggests that his attire was not extraordinary in the context of Regency society, Brummell's personal attention to detail, function, and cleanliness as well as the fine materials, rare craftsmanship, dignified bearing, and mastery of social etiquette required to maintain such a wardrobe set him apart. The casual equestrian origins of his dress challenged courtly protocol and heralded the pared-down simplicity of masculine attire in the later nineteenth and early twentieth centuries. Even in his lifetime Brummell was becoming a figure of fiction. A wide range of anecdotes and sayings were attributed to him. Sir Edward Bulwer-Lytton satirized him in his 1828 novel Pelham; or, The Adventures of a Gentleman. Mr. Russelton, a thinly disguised Brummell figure, boasts that he employs three tradesmen to make his gloves: "one for the hand, a second for the fingers, and a third for the thumb!" Brummell's reputation spread to France, where Honoré de Balzac fictionalized him in his Traité de la vie Élégante (Treatise on the Elegant Life), first published as a serial in La mode in 1830. The most important French writing on Brummell is Jules Amédée Barbey d'Aurevilly's short tract of 1845 entitled Du Dandysme et de Georges Brummell (On Dandyism and George Brummell). It celebrates Brummell's dandyism as a spiritual achievement of the highest order and raises the dandy's status to that of the poet or artist. This text shifts the terrain of dandyism to a superior intellectual and philosophical ground. Later nineteenth-century texts highlighted the artistic nature of the dandy and his cultivation of both his environment and his dress as works of art. These literary interpretations preserved the heritage of Brummell through the nineteenth century and brought him, transformed, to twentieth-century audiences. In the first half of the twentieth century, his life would be reenacted in new venues, in the theater and on the silver screen. The playwright Clyde Fitch was commissioned by the matinee idol Richard Mansfield to write a play based on Brummell's legend. Beau Brummell premiered on 17 May 1890 at the Madison Square Theatre in New York City, starring Richard Mansfield and Beatrice Cameron. An illustrated version of the play was published in 1908 and remained popular into the second decade of the century. Three Hollywood films loosely based on Fitch's play were made in the first half of the twentieth century. The first, just sixteen minutes long and directed by and starring James Young, was released in 1913. The second film, produced by Warner Brothers in 1924, was a star vehicle for John Barrymore. This lavish costume movie was released worldwide and was on the New York Times topten list of films in 1924. In 1954 MGM studios came out with an even more extravagant production. This version cast the swashbuckling hero Stewart Granger in the starring role, alongside Elizabeth Taylor and Peter Ustinov, who is wonderfully petulant as the Prince Regent. Although it was produced in America, it featured both British and American actors and drew on the talents of the celebrated British costume designer Elizabeth Haffenden, who worked in collaboration with Walter Plunkett on this film. Despite the British cast and costumes, this Americanized Brummell is presented as a social and sartorial reformer who leads Britain from outdated, luxurious aristocratic mores into the more democratic, industrial, and progressive era of the nineteenth century. This was the final cinematic version of the Brummell legend, which has found new currency in literary accounts, such as George Walden's essay and translation of Barbey d'Aurevilly's text, entitled Who Is a Dandy? William Jesse referred to Brummel as "cool and impertinent." Brummell's self-mastery and calculated sense of cool, his rise to fame in Regency society, and his sartorial perfection are his hallmarks. His name has become synonymous with dandyism, and the plaque marking his house in Chesterfield Street reads simply and appropriately, "A Man of Fashion." See also Art and Fashion; Dandyism; Fancy Dress; Theories of Fashion. Barbey d'Aurevilly, Jules. Who Is a Dandy? Translated by George Walden. London: Gibson Square Books, 2002. Bulwer-Lytton, Edward. Pelham; or, The Adventures of a Gentleman. 3 vols. London: Colburn, 1828. Fitch, Clyde. Beau Brummel: A Play in Four Acts. New York: John Lane, 1908. Jesse, Captain William. The Life of George Brummell, Esq., Commonly Called Beau Brummell. London: John Nimmo, 1886.